This is a practical story to follow up on a previous post about how often we slip into the trap of thinking “church” is our personal Lord and Savior instead of Jesus. This new post is the story of our encounter with Amber (Name changed for courtesy). If you haven’t already, CLICK HERE to read previous post “Church, My Personal Lord & Savior”, and then come back to read Amber’s story. It was after that statement that I realized how deeply ingrained this thought process is in our culture. Even after clearly sharing the Gospel, and how Jesus had no desire for her to go back to church, but to be with HIM she still had this mindset that “when she was ready” she would “go back to church”. Our time with Amber was not in vain. She definitely encountered the love of God, and was teary eyed at several points throughout our conversation with her. She got to experience His love through us, and hear that He wanted her to dance again. (She was a ballet performer & instructor until the injury to her knee) She got a small taste of what it could mean to follow Jesus and BE a part of His Body. We got to play a part in chipping away at that mindset that “going to church” was what was going to “save her” or solidify her “standing with God”. She encountered some people who heard the clear call of Jesus to “follow Him”, not the call to “go to church”. We spent the rest of the day offering up spontaneous prayers for Amber’s heart to let go and love Jesus. I offered up a secret prayer that God would “SAVE HER FROM CHURCH”, and “to Himself”. As “Christians” here in America we are sometimes the quickest to slip into idolatry. A primary scheme of the enemy is to take things that are “good” and convince us those things are more worthy of our worship than Jesus. (Even “worship” itself! See how sneaky satan is) We get easily distracted, and accidentally start worshiping the created thing instead of the creator of the thing. For years this mentality that “church” is what will “save us” has tainted our view of Jesus, and what it means to BE a part of the Body of Christ. Of course, nobody comes out and says something like, “salvation is through faith in church”, or “you must go to church to be saved!” But, it is something deeply ingrained into the Christian culture here in America. Because we have lost sight of every believer’s call to make disciples, and settled for a religious system made up of a few select people who do so for us, we have communicated to the lost world that it is in fact “church” that will save them first and foremost, not Jesus. The above story has actually led me to believe that many people may actually need to be saved FROM church in order to know Jesus as Lord as opposed to the other way around. The world needs Jesus. They don’t need church. The beauty is that when the world has Jesus they are automatically a part of THE CHURCH. Relationally they have everything they need, and are being obedient to everything they have been called to as a part of the larger Body of Christ. Continued from previous article “Enough of the Talking”. Perhaps some modern theologies, or doctrines might parallel this story. This is not an argument for or against Cessationism, but one of many examples of how our doctrine might be challenged by real-life experience. If I claim to be a cessationist (based upon how I was indoctrinated) most of my Christian life, but then go overseas, or right here in the states and witness countless physical healings or even resurrections then “something’s gotta give”. At this juncture do I stubbornly cling to my theology (which was most likely based upon the scriptural interpretation of a dead guy, or particular stream of denominations), or do I recognize that I may not have had God quite as “figured out” as I thought I did, or thought they did? Again, my pursuit through this article is not to challenge having sound doctrine, but to challenge what that sound doctrine is, where it comes from, how we allow it to indoctrinate us, and which doctrines require a much looser grip. I am not suggesting that our experiences define our doctrine, and what we see as truth from scripture. However, our experiences as we pursue Jesus should shape and mold our doctrine, how we interpret truth in scripture, and how tightly we cling to “negotiables”. Perhaps this discussion will be “easier to swallow” if we recognize that much of what we think is our doctrine can be whittled down to mere tradition, or ritual. Most of us do not realize how we have allowed that tradition to become a major part of our doctrine when it was never meant to be. This is scary and dangerous. At the same time all of our doctrines have bits that are just plain perverted, and not in alignment with the Kingdom or heart of God. How about the issue of ecclesiology, or more plainly put, “church”? Sometimes our doctrine is more defined by our actions than what we say we believe. For example, most Bible believing Christians would say that the church is not a place, but the people of God. However, their actions as a person of God have become defined by going to church once each week. Or, most of us claim to believe, and desire to pursue living out the Great Commission. This includes the act of Baptizing new believers, and distributing communion. Most people who claim Jesus as Lord have never baptized a new believer into the kingdom, or intentionally administered communion. Again, our actions prove otherwise. We may not know it, but these things define parts of our doctrine, or theology. Let’s close with a few more practical examples of how this might play out in real life. Perhaps you were raised in a “camp” that viewed alcohol as “evil”. The truth you extracted from scripture was read through that lens. You could preach a sermon on why alcohol is evil, and combat anyone else‘s attempts to reason with you. Then one day you met a dear saint, and warrior for the Kingdom who you learned likes to enjoy alcoholic beverages on a regular basis. Uh-oh. You are left with two choices. Either you judge your new friend who has an abundance of Kingdom fruit in their life, or you release the tight grip you have on your “theology/doctrine of alcohol”. You might come to a much simpler conclusion that your pursuit against alcohol became quite idolatrous, and completely negated Christ’s work on the cross. This is funny, sad, and true all at the same time. Those of you who have worked on staff at churches before know this routine all too well. My heart hurts a bit to watch it. It doesn’t have to be this way…I MIGHT go as far as to say it SHOULDN’T be this way…but I won’t, actually. Talking is something we are really good at as American Christians. In our insecurity we gain endless amounts of knowledge about who Jesus is. We study, read books, go to school, and do all sorts of things to validate ourselves as God’s children. The problem is at the root we have neglected to find our validation in who Jesus is to us as an active part of His Body, His Bride, The Church. We replace the commands of Jesus to DO His will, and resort to merely becoming experts at knowing His Word. We even take it a step further by creating our own doctrines and theologies in order to lambaste those who might threaten our comfortable Christian lifestyle. We know our five points, “ecclesiology”, eschatology, theology, and doctrine along with a defense to anyone who might challenge us in this comfortable certainty we have created for ourselves. How certain can we really be if what we claim to know never leaves the Starbucks table where we sip coffee while enlightening our young up-and-coming “disciple” who we have fooled into thinking we are brilliant? We now have a new convert whose salvation is sealed by the passing along of our fancy words and deceptive knowledge. (1 Cor. 1:20 – 1 Cor. 2:5) This new “convert” who we think is “grounded” in knowledge of the Word & doctrine through our passing along of information may not be as grounded in either as we thought. There is definitely a root issue here seeded in how we truly make disciples of Jesus, but an even deeper root of how we allow ourselves to be discipled first. We can only make disciples to the extent that we allow ourselves to BE discipled. When our pursuit of Jesus becomes hijacked by our pursuit of defending the particular doctrine that was handed down to us we cease to be disciples and start to be defenders. Whether we have become greater defenders of John Calvin’s five points, Bill Johnson’s healing or eschatology theology, or Mark Driscoll’s view of what it means to “be a man” we have ceased to pursue Jesus and His kingdom. While the above men are all great men of God they are mere men; one of them is dead. Jesus came back, and that is why we worship Him, and pursue His kingdom over any other man who ever walked the earth, right? Can you think of anything in your life that you used to believe, or think as truth that you have come to grow away from due to God pouring out more grace on you? I hope we can all say yes. For example, were any of you raised like I was thinking the idolatrous lie that alcohol is “the devil”? There are thousands of examples we could reference. Surely we do not claim to have this whole God thing figured out…? How arrogant. Surely there are things we once clung tightly to that are no longer worthy of our tight grip. Why then, do we continue to allow ourselves to fall into the same trap over and over again? It is the trap that causes us to release our grip on one thing as we grow in our understanding of the kingdom, but quickly cling to another-perhaps with more strength than before. We become experts on what we “know that we know that we know”. We cease to be students of our great teacher. After all, we have Him figured out already, right? It’s in our doctrine. I am not against doctrine. I do not dare come against the need for being grounded in the Word, and having “sound doctrine”. My pursuit with this article is to challenge what we think “sound doctrine”, and being grounded in the Word means, along with how we “attain it”. Most of us think we are “grounded in the word” by having a well read/versed man with a degree teach the scriptures to us on a weekly basis. Or, we listen to “lots of sermons and podcasts online”. Even better, we spend all day in commentaries & Systematic Theology books so we can use big words to win an argument against someone with “different theology” than us. Or my favorite, the ability to robotically repeat what Matt Chandler and Mark Driscoll believe about things. We think having sound doctrine means being able to explain everything about God, and the Bible in any context. Sure, there are some non-negotiables, but the doctrine of many becomes a huge list of non-negotiables, certainties, and attempts to explain away or wrap our heads around the things of God that our human minds cannot comprehend. Perhaps the only non-negotiable we should have is the fact that Jesus is Lord through His death, burial, and resurrection for the salvation of man to pursue ushering in the kingdom on earth as it is in heaven; all of this is through the leading of the Holy Spirit given to us by Jesus, the Son, through God the Father for intimacy with Him. Christ said we would see “greater things than these”. Then, He gave us His Holy Spirit, and a commandment to make disciples. Arguing about doctrine with other believers not only causes division and disunity among the body, it also does not cause unbelievers to trust Jesus as Lord. There is so much talking, and so little being, and doing. There comes a point in many of our lives when we can no longer sit around simply knowing God’s word, and what we believe about this and that issue. That point is when we embark on an adventure with Jesus that causes us to wonder what we had been doing all that time, and praise Christ for the measure of Grace He has poured out on us. It is throughout this journey that we are forced to be grounded in scripture to avoid the schemes of the enemy. It is this adventure that shapes and molds the doctrine we come to believe as the Holy Spirit speaks to us and brings revelation through scripture. This pursuit of Jesus is not meant to be a comfortable, or easy one. When we start really following Jesus, and taking the things we say we believe seriously by doing them things might get a little dangerous. After the danger comes and we continue to press into the Kingdom we will begin to learn what it truly means to call Jesus Lord. Stay tuned for “part two” where we will dive into some real-life examples of how Jesus continually shapes our “doctrine” in a healthy way as we pursue life on mission in the context of community. The entire evening, other than perhaps during a prayer to “bless the food”, the name of Jesus was not mentioned once. No stories about Jesus being introduced to anyone, or anyone being “invited” to experience Jesus as a powerful and living God right here and right now. No stories of anyone being impacted in any way by Jesus Himself. Again, the NAME of Jesus was not mentioned once. Was it on purpose? Of course not. Am I certain that everyone in that room loves Jesus? Yes. Was this neglect of Jesus intentional? Of course not. When anything takes the place of Jesus in our lives the focus goes to that thing…and off of Jesus. That thing takes the throne. We are guilty of idol worship. When our primary goal is to get people to go to church (Of course, with the desire and hope that they will eventually “meet Jesus”, or make a decision to follow Him at some point) we have replaced Jesus with church. We communicate with our actions and words that “church” is savior, and forgiver of sins. We bow down in worship to church. “Church” did not die on the cross for our sins – Jesus died on the cross for us, His Church, His Bride, so that He could become all that we worship. As the TRUE lover of our souls our number one desire MUST be to introduce others to Him. As a part of the process we become a part of the body of Christ! We naturally gather with other believers as a result, but hopefully not spend too much of their time with those believers. Hopefully, we will then begin introducing others to…yes…Jesus…not our new church. I am around different types of people all throughout the week, as I am sure many of you are. Something I have noticed in the people I am around who do not claim “membership” to a particular “church” as a building with a name, or institution is the things they place value in. Every single time I am with these people they are full of joy as they share stories of individuals who they have been discipling, and walking with. They share about how Jesus is becoming Lord to these people. Then, they invite me to this new believer’s Baptism after they have led them to Christ! A natural result is always that these new believers are connected with the body of Christ in some form or fashion-usually very healthy. They may not be filling the pews of a church on Sunday morning, or “serving” in a church program. But, they are actively out proclaiming to others this new love they have found in Jesus as He has become their Lord. There is much freedom in the above…it feels weightless, and light…it feels like a journey of obedience & dedication to Jesus. This is far different from the conversations I have with others who have dedicated and given their lives to the “church”. Discussion is more about endless struggles with sin and trying to manage that sin. 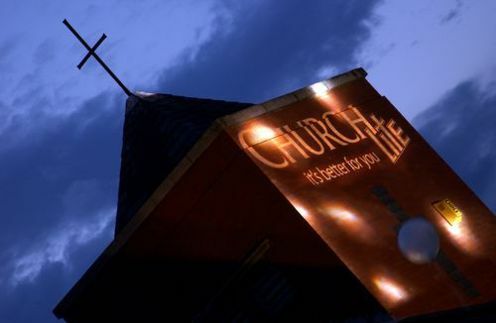 It’s about the uncomfortable invitation to church on Sunday they have extended to their neighbor for months-wondering why their neighbor won’t come. It’s about how good and funny their preacher’s message was the previous Sunday, and how much they loved “that one song the guy played”. Again, none of those things are necessarily bad, but when they take the place of Jesus as Lord in our lives we become idolaters. Those of you who know me know that I am not a fan of any particular model of “doing church”. I think that conversation is silly – we don’t “do” church. We BE Church. If you are BEING Church, and obedient to Jesus at your church then these words are not for you. I am not at all submitting that this is the case across the board. I am simply sharing observations I’ve made in cities all over the country (three of which I have lived in for long periods of time) among people in both scenarios. If Jesus is your Lord in both words & actions then let’s praise Him for that! If something else has sneaked in and taken the place of Lord (perhaps “church”) then may we all run hard after Jesus together to place Him back on the throne in our lives. CLICK HERE TO READ CHELSEA’S BLOG. (The first bit is about our dinner outing this past weekend as we celebrated our adventure together over the past 6 months, and enjoyed one another one last time before the move(s).